The fates can be cruel. A gorgeous fat bike sitting in my garage and too damn cold to ride. The coldest February on record and this bike is there teasing me. I had to wait until it got to about -5C to go for a decent ride. It wasn't the first ride of the year but after a month of riding the spin bike it felt really good to be out riding through the snow in fresh air. 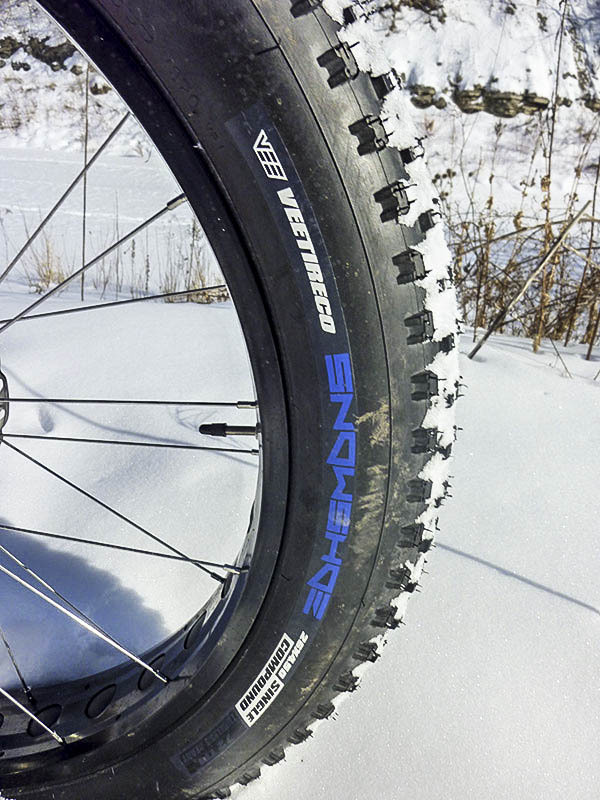 The final bike in our Canadian Cyclist fat bike test is the Norco Bigfoot 6.1. If you are an old mountain biker like me the Bigfoot was a hugely successful name for a Norco bike way back in the 1980's. When I met my wife Natalie she was riding a Bigfoot and I remember it being quite a decent machine for the time. I'm happy to report it still is. If anything the name is even more appropriate for the fat bike mode and I'm happy Norco applied it here. 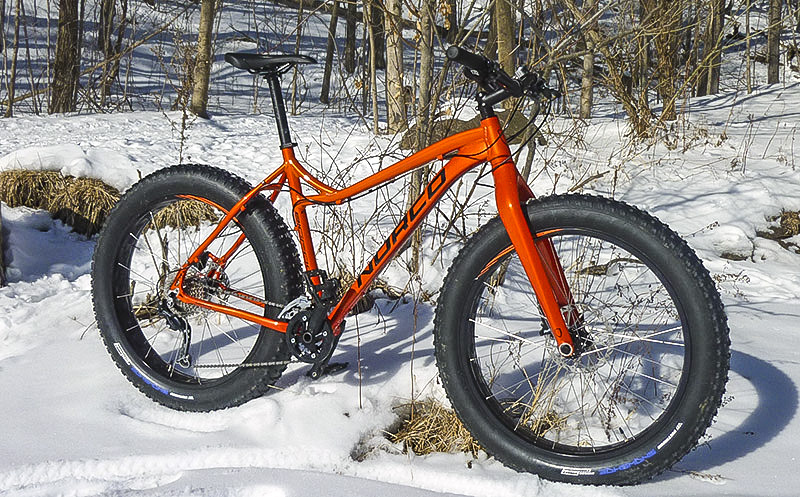 Norco offers five models of fat bike. We have our Bigfoot, available in three specs, a Bigfoot E electric assist, and the higher end Sasquatch (another name from the past). The Bigfoot 6.3 is the lowest cost model with an MSRP of $1100, with our test 6.1 at the top end of the range at $2095. This is one pretty looking bike. The orange metal flake paint is very well executed. It is bright and shiny and helps to standout on any winter, or summer, day. My eye was immediately drawn to the beautifully sculpted carbon front fork. I didn't really expect to see a tapered head tube carbon fork on a bike at this price point. It has gorgeous flowing lines that would make me hesitate to ever add a suspension fork to the Bigfoot. The dropouts on the fork are aluminum with an unusual (at least to me) dropout. It is a modified QR thru-axle that uses a 15mm diameter shaft that has a threaded cap on the opposite side. Inside the dropout are slots where the hub end caps slide in. There is even a set screw that you can close down to keep everything in place. The frame is nicely shaped out of 6061 aluminum with extra gussets and reinforcements. An extra brace from the sloping top tube to the seat tube is well executed, as are the rear dropouts. On our XL test bike the seat tube angle was a very steep 74.8 degrees. It helped climbing a lot but I felt that I was more on top of the pedals rather than my preferred slightly behind when riding on the flats. The component spec is a combination of Norco's fine in house products and a largely Shimano drivetrain. Shifters are Alivio, with an SLX front derailleur and a Deore rear. The crank is Samos, a brand unfamiliar to me, with 32/22 rings and a bash guard. A Shimano 12-36, 9 speed cassette completes the drivetrain. Brakes are SRAM DB 3 hydraulic discs with a 180mm rotor in the front. The rims are 80mm wide with lots of cutouts, laced with black stainless spokes. The front hub is a Novatec and the rear is a KT. The tires are Vee Snow Shoe in 26x4.5 folding bead. The wheels comes tubeless out of the box. The cockpit and saddle are Norco in-house products. Climbing on board I noticed the tires right away. Do they ever grip in the snow. I found that with some of the bikes in our review that I could get the rear tire to spin out easily. Not here. With the tubeless feature you could run even lower pressure than usual to give a little bit of cush, and to also increase the traction. True, it does slow you down, but as long as you keep pedalling the Bigfoot will pull you through. I appreciated the point about running lower pressure in the front end as well. The Bigfoot is one really stiff bike in the front end. Some shock absorption on the hard, frozen trails was badly needed. As beautiful as the carbon fork is, it is also extremely rigid. Somewhat contributing to the pounding are foam grips. I'd ditch them immediately for something with more comfort. I've got an approximately 18km route that I typically run test bikes around. It has urban bike path, some single track, ups and downs out of the Credit Valley, and even a few hundred metres of pavement. I don't think I've ever run that route in as much snow as I did with the Bigfoot. As long as I kept out of the deepest drifts I just kept going. Despite the weight of the bike (with pedals - 14.9kg/33 pounds) climbing got done even with the snow. Those big low pressure tires and the steep seat tube made for successful ascents. Gear down and just keep churning. The cold didn't seem to faze the brakes. They never let me down. The drivetrain performed well despite being wet and snowy. The only minor gripe is that the front shifting is a victim of having a double crank with a triple shifter. You've got that extra stab at the levers to make it work. Also the mounting of the front derailleur strikes me as a bit high. You can't adjust this as the front derailleur is fixed. One of the locals was out on his freeride bike the last time I was out on the Bigfoot. Despite almost 3" wide tires he was struggling. He loves to ride all winter and will brave colder temps than I will, but he said the snow was the make or break for him and he was clearly broken. He was seriously considering getting a fat bike after talking to me. The Norco would be a good choice. The Bigfoot 6.1 is a lot of bike for the money. It looks great and it performs well. If it is a bit much for your wallet, then consider the Bigfoot 6.3 at $1100. It has a lot of the attributes of our test bike. - Cross Country skiers are really taken aback when you approach them from behind and you ring your bell. I rang a good distance back and some of them practically jumped out of their skin. They simply aren't expecting a bike to be out there. You are also one heck of a lot faster than they are, so use your best trail etiquette. - I had a lot of walkers actually stop me and ask about the Bigfoot. I haven't had that with a test bike in ages. 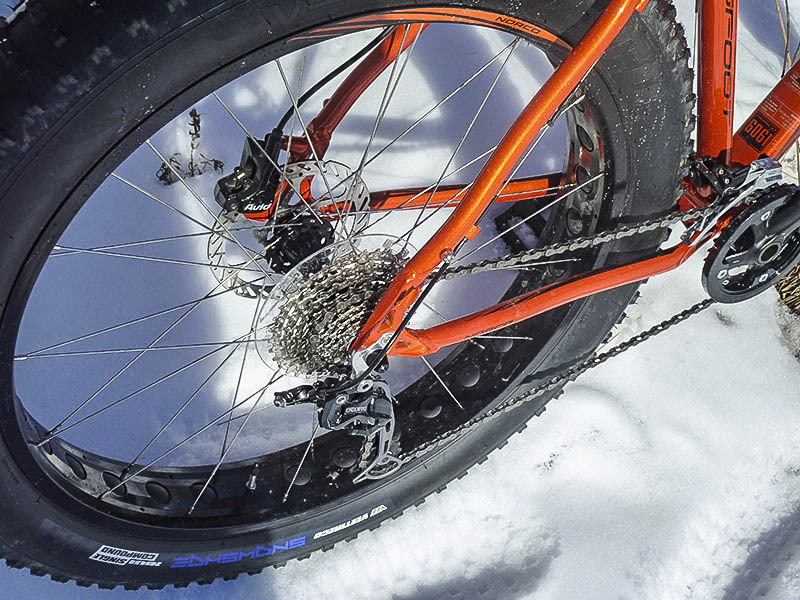 People are really, really curious about the fat bikes. Maybe we will see more of them in the future. 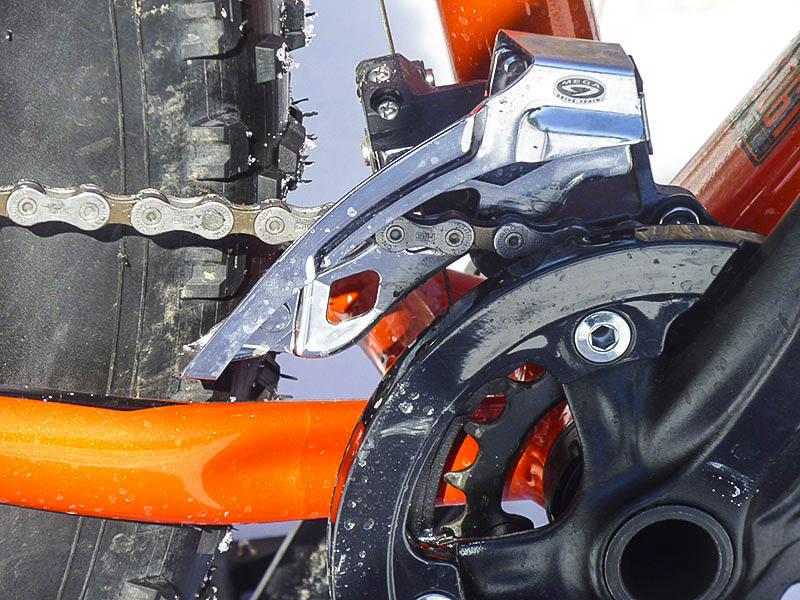 - Seriously consider how you are going to transport the fat bike on your vehicle. I drive a 4 door compact hatch and even with the rear seats down and the bike's wheels off a fat bike won't fit inside. Due to the width of the tires the bike won't fit in channel style roof racks either. 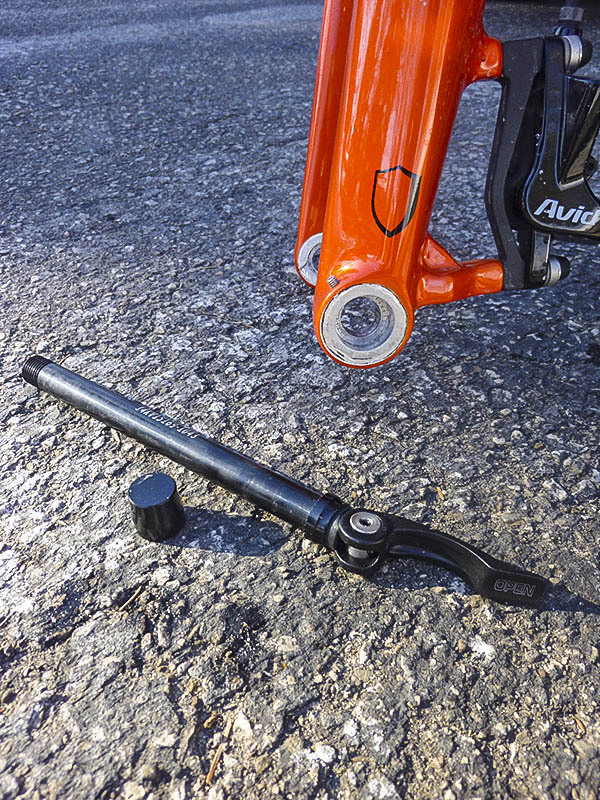 You would also need an adapter for the extra wide front dropouts. We also have a 3 bike hitch mount rack. Only 2 fat bikes would fit.